Land Pride's DB2660 Ditch Bank Rotary Cutter complements our growing line of Rotary Cutters. 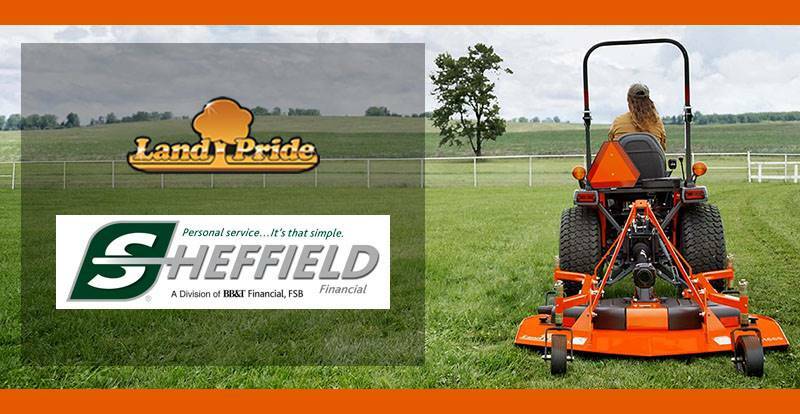 This hydraulic-driven cutter boasts a number of features that will make mowing ditch banks, pond dams, or other hard to reach inclines fast, easy, and efficient. Built for either 540 or 1000 RPM tractors, the DB2660 features a 58 in. cutting width, 1 in. cutting diameter, and 32 in. cutting reach. The 1/2 by 4 in. blades rotate clockwise at 15,000 fpm, directing debris away from the tractor. Minimum cutting height is dictated by the tractor's 3-pt height. LONG HORIZONTAL REACH: Good access for reaching vegetation far away from the tractor. BUILT IN AUXILIARY WEIGH RACK ON LEFT SIDE: Suitcase weights can be added to left side for balance. Able to choose the weight bracket to match various types of suitcase weights. 175 DEGREE DECK ROTATION: Angle Cutter head can be positioned to reach different angles. 3 POINT DESIGN: Does not require a dedicated tractor. Three point hook up is easy to hook up and remove from tractor. Minimum Transport - 121 in. Horizontal Cutting Extension - 32 in. Maximum Horizontal Reach from Center of Tractor - 158 in. Minimum Weight - 7,000 lb. Minimum Lift Capacity - 2,500 lb.